Forty-six is shaping up to be the most important number of the year. 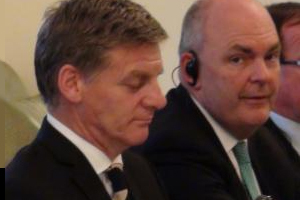 It’s the number Bill English and Steven Joyce go to sleep thinking about. If National drops to 45%, the Maori Party would need to pick up two extra Maori seats off Labour to take their tally to four – giving 62 out of 123. That will also save National’s bacon if they drop to 44%. Forty-three is the number Winston Peters goes to sleep thinking about. At 43% or below, National is in Winston territory, provided the Maori Party win fewer than six of the seven Maori seats. The Roy Morgan poll on Friday  would return National to office with the current bunch. A warning though: it was conducted before the Barclay Affair resurfaced. The poll showed a lift for National and a drop for Labour. Given the pre-Barclay Budget aftermath, this wasn’t surprising. Our attention now turns to the National Party conference over the weekend. At time of writing on Friday afternoon, it was said no big policy announcements should be expected. English is supposed to be conveying a steady-as-she-goes approach. There will be warnings about how disastrous a Labour/Greens/NZ First Cabinet would be for the country. This kind of talk has helped National until now. The party hasn’t needed big policies or set-pieces. That’s all been left for Opposition parties. Yes, set pieces certainly attract attention, but they’re also much more likely to scare an electorate. Just look at the elections lost and policy options dropped by Labour and you see why Key, English and Joyce went about their business these last 10 years on a platform of incremental policy change. The big question is, will that continue to work in light of last week’s events? A key priority for National will be to get the Barclay Affair off the front pages as quickly as possible. Labour’s disastrous link to Matt McCarten’s unpaid international student vote-boosting scheme helped, but that should drop more quickly than National’s problem. Winston Peters is now fronting the Barclay Affair response. He’s much keener to go after English on that than Little on immigrants. Peters knows Labour will need him to have any chance of forming a government. At the moment, English doesn’t. Peters needs National’s vote to fall below 43% to be sure of being kingmaker. My gut feeling is there is a high hurdle for the Barclay Affair to knock National off its perch for the whole period from now until 23 September. This isn’t a comment about what went on in Clutha-Southland or the subsequent actions of everyone involved. Terrible actions, terrible look. But I think English will manage to regain some of the ground that he personally has lost. To me, the key exchange in English’s police interview is this: Interviewer: “Do you know if was Todd present [sic] when the recordings were made or was he absent from the office?” English: “I don’t know.” That was the last exchange of the interview. If that’s all there is on that, it technically means English did not know if the recording might have been illegal or not. I would also expect something along the lines that English, as Deputy PM, had people above him. Money was paid from the Leader’s budget, remember. We will hear next week whether police will reopen the investigation, based on what Barclay has now said publicly. Let’s say the focus shifts away from English. How does National try and regain the inevitable lost ground after this saga? They’ve been building up a buffer. If you have a child at school, take a look through the last few months’ newsletters. I’ll bet you the percentage points of the vote Winston Peters will pick up from this week that one of them has a photo of Nikki Kaye, crouched slightly, hands on knees talking to a couple of five-year olds during a sod-turning ceremony for some new classroom. Classrooms, incomes, house price moderation (but not falls!) now you’re all valued up with the price rises of the last few years, a patch-work alternative Cabinet, being responsible by paying down debt. It has worked so far without the need for wild spending promises. Is this time different? * As I’ve written before, if Hone Harawira picks up Te Tai Tokerau, this would help Labour. National would require a 47% party vote if its support partners only return their current seats.